Today, I want to talk about blogging. Now, before you groan (because we all know the subject’s done-to-death), stay with me for a moment. Blog strategy is fresh in my mind, because I’ve recently shifted both my design and my content. My reason for changing was simple. I wanted to eliminate the huh? factor. I’m ready to take on more clients. I need to market the Media Blueprint. But I knew that someone visiting my site after talking to me about media relations or outreach strategies would be thoroughly confused. Other than PR Ideas for Busy People, I simply wasn’t talking about the work I do. What the heck does a post like What are you saying yes to? have to do with spreading your message? A lot, actually. But I wasn’t making that clear. My site is motivated by a passion of mine, an obsession, really. I’m obsessed with the idea of congruence. To me, congruence means making your outsides reflect your insides. The past 5 years of my life have revolved around a process of constant experimentation and alignment, as I strive to bring my actions in line with my values (as stated in my personal mission statement). That’s what this post is about. And this one. And, well, pretty much all of them. It’s also what my work is about, on two levels. First, the design of my services bring into alignment my passion for indiepreneurs, my deep feeling that they deserve the attention given to their established competitors and my particular skill set for outreach strategy. My work reflecting my values. Second, my particular approach to PR is to create outreach strategies that flow from my clients’ fundamental principles. For instance, in addition to asking clients where they’d like to see their work featured, I always ask how their product or service reflects a broader vision and what lessons they’ve learned since they first launched. This is congruence, applied to business. Outreach built on a rock-solid foundation. I’m about to start writing a lot of posts about this idea. It’s a conversation that’s missing in the blogosphere, and it’s my personal opinion that it’s the missing link in helping people understand how to use the web or other outreach tools to get their message out there in a way that feels productive and focused. I talk to a lot of people that feel confused or like they’re engineering sincerity. I’m uncomfortable with the advice out there that says I should share my entire life on my blog, Twitter and Facebook. I forced myself to try it, and it didn’t feel good. And I also know super successful people who don’t do that. What gives? The straight answer is that kind of advice probably isn’t right for your business, but it may be for someone else. There is a range of bloggers out there, as varied from each other as Kim Kardashian is different than Bill Gates. Some, like Kim, trade on celebrity. Heather Armstrong comes to mind. For those people, sharing the intimate details of their lives is good strategy. For the writer of this question, probably not. Blogging is a tool. You can use it as a journal, a marketing channel, an inspiration board, or however else you want. How you use your blog depends wholly on what your goals are. This is what I see missing from the gluttony of posts on how to blog. I struggle with this question all the time. It’s compounded by the fact that I identify more strongly as a writer than as a consultant. Here, I have an outlet. A large part of me just wants to write stuff, screw the why of it all. To an extent, I allow myself a massive amount of leeway, and that’s okay. You might want to know that I’m settled in Sacramento now. People like connecting with other people, not organizations. 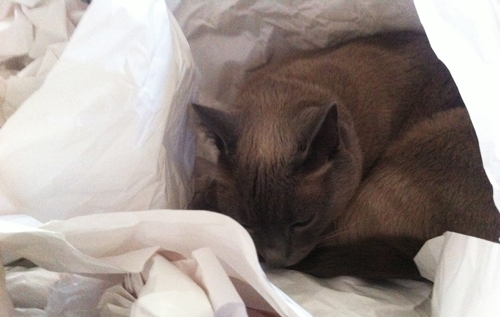 So, I’m posting an adorable picture of my cat napping in packing paper. Bask is the cuteness! But probably you don’t care to hear what my breakfast was this morning. And it’d be pretty boring for me to write about that anyway. For me, writing is more fun with boundaries to test. The day I tell you it has to be that way for everyone is the day I go get a new day job. I’m here to help you break on through. To help you find the right way to share your message, in a way that feels good to you and is relevant to the people you’re hoping to serve. Not to prescribe the tactics that work for me. Do you agree that this conversation is missing? Is there something in particular you’d like to chat about on the site? I’m open to post topics, collaborations, guest posts, you name it.